At a time in antiquity when most of Europe was covered with forests and wandering tribes, Mexico had already developed complex civilizations, beginning with the Olmecs and followed by the Maya, a civilization with advanced knowledge of medicine, engineering and astronomy. The Maya calculated the precession of the equinoxes and cycles of the Pleiades, on which they based their year, since they believed they had come from that constellation. The last, and perhaps most famous, great civilization before the arrival of the Europeans was the Aztecs. With so many ancient peoples whose influence, beliefs, and modifications to the landscape extend to the present day, Mexico is fertile land for legends, ghosts, surprising places, and mysteries. A belief in communing with things that lie beyond (stars, constellations, and life after death), mysticism, and apparitions are intimately woven into the colorful fabric of the Mexican nation, to the point that a metaphysical event (the apparition of the Virgin of Guadalupe) is considered by many as one of the founding elements of the nation. Our Lady of Guadalupe has an eerie counterpart, another woman who appeared around the same time: La Llorona, the weeping woman. If the content of the former vision is loving and conciliatory, the latter is full of regret and agony. La Llorona is just the first of a long procession of even less benign ghosts. For many years, human sacrifices and endless cruelties were committed in present-day Mexico City. People across the country believe that a legion of ghostly voices - if one believes in ghosts as a byproduct of repetition, remembrance and re-experience of tragic memories - can still be heard in the cities and valleys of Mexico. After all, archaeologists have found evidence of chilling human sacrifices in the Mexican capital, proof that the ancient inhabitants honored their gods by decapitating the bodies of their prisoners and putting their bleeding heads on a stick. Several sites have been found, and the largest one was unearthed in ancient Tenochtitlan (now Mexico City), which may contain up to 60,000 human skulls. Mexico's territory was relatively unknown until the beginning of the 20th century, even by its own people, as many of its ruins and natural wonders were out of reach or buried under thick jungles. It wasn't until the development of the railroad at the turn of the 20th century that this vast country (the world's 14th largest) began to reveal its secrets. Once Mexico was pacified, the interest in Mayan and Aztec ruins and the strange stories that circulated in the villages brought dozens of archaeologists, anthropologists, photographers and historians from all over the world. From that point, the nation was able to show its charms and mysteries to its own people and to strangers. The south kept memories of a race that talked to the stars, the center possessed ghosts filled with regret and resentment, and the north teemed with places that only a science fiction writer could imagine. 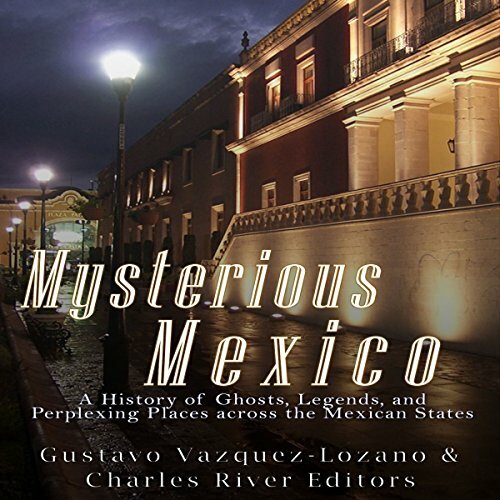 The result is a collection of the most surprising, mysterious, and terrifying aspects of Mexico, including magical places, puzzles of history, and strange beings and apparitions. Mexico is a mystical country where everyday people have learned to live with their ghosts, old and new. As Octavio Paz, the Literature Nobel Prize winner, once said, "One of the most remarkable traits of the Mexican character is its willingness to contemplate horror - the Mexican is even familiar and complacent in his dealings with it." This book was full of little snippets of history that one doesn't hear much of. The stories are quick reads and if you come across one that doesn't grab your interest the next one probably will.